I've loved fairy tales and myths since as early as I can remember. I still have an old, frayed set of heavy books full of old tales with covers featuring knights in armor and ladies riding side-saddle in flowing robes through green forests. I even spent a year or so making my own flowing robes from old curtains during my college years in a back-to-nature phase. But I digress. My point is that these tales are near and dear to my heart. 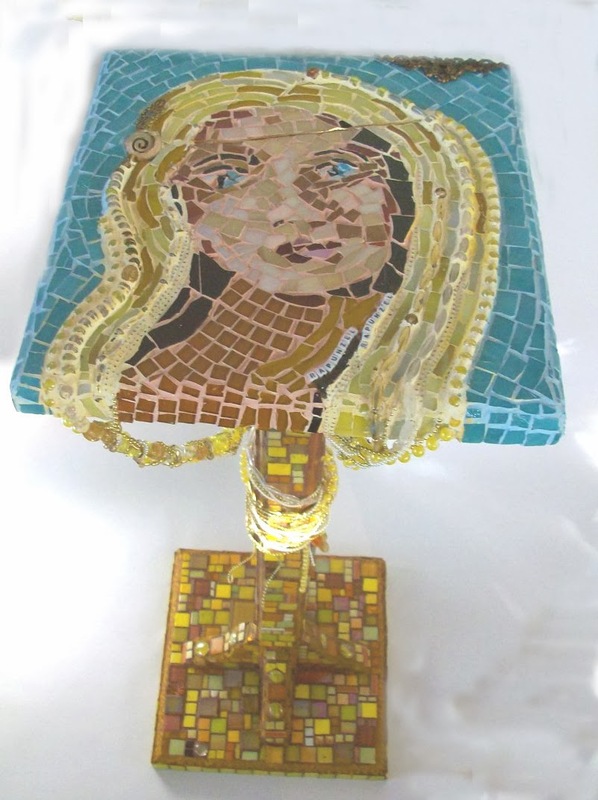 So, about a year ago, when I was visiting my friends Chris and Gordon Turner at the Baobab Gallery in Bradenton's Village of the Arts, and they brought out a pedestal table that they didn't want any more and invited me to mosaic it, I thought of Rapunzel's tower. 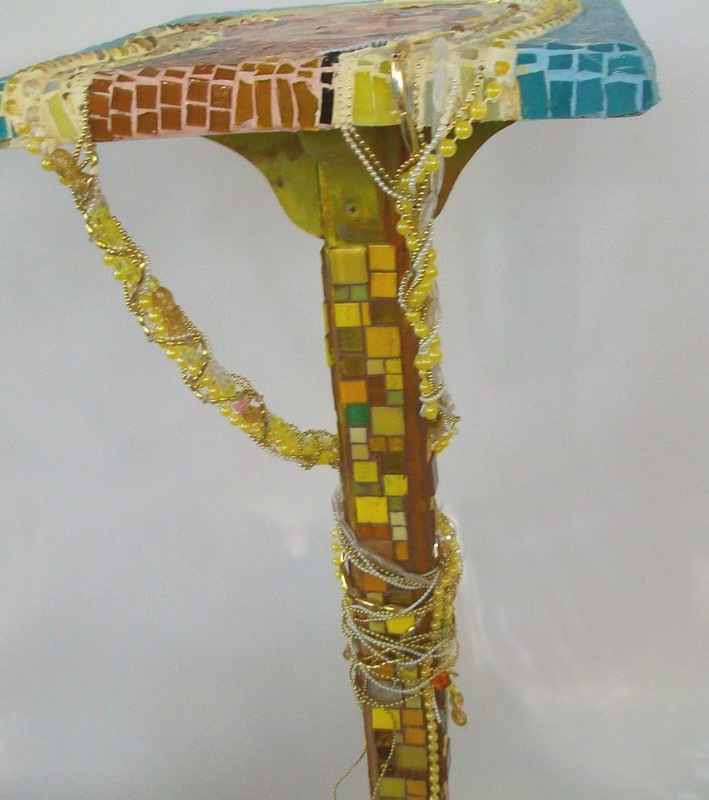 It's a skinny, top-heavy-looking thing that looked like it might crumble at any moment — so that's how I decided the stem and base of the table should look. Usually my mosaics are more "finished," but this time I deliberately gave the base a more primitive look, since in the story the tower is old and rickety. I started with the top of the table, with Rapunzel's face. I didn't have any person's particular face in mind, I just knew that I wanted a youngish girl's face, so I just drew from memory. 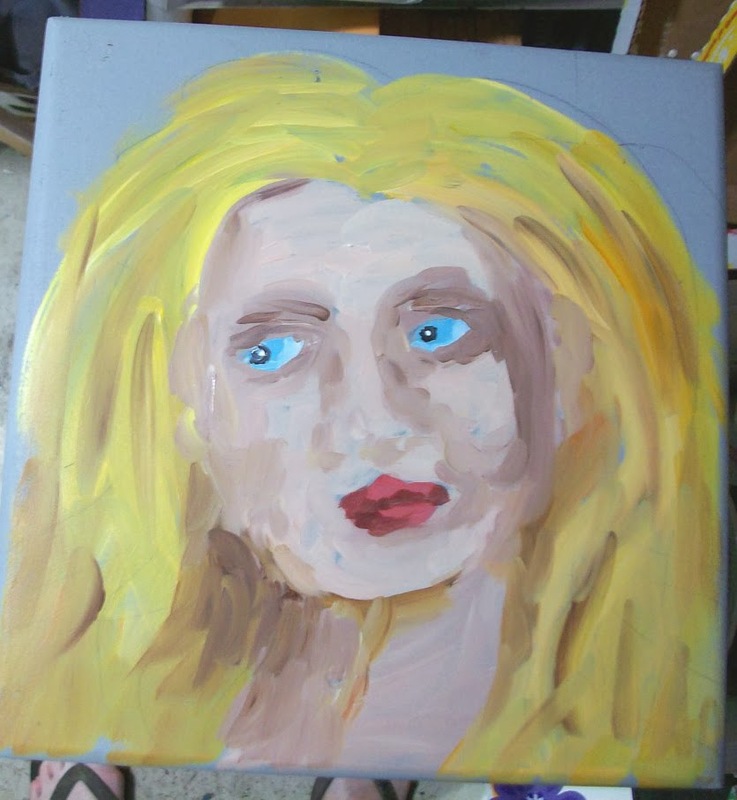 I borrowed a technique from my friend Elizabeth St. Hilaire Nelson, and painted a face in acrylic first on the top of the table. I had never tried that before — usually I just do a quick pencil sketch or go straight to the mosaic pieces — but I found that the painting gave me a better direction as to color and shape. Thank you, Elizabeth! Rapunzel's hair was the fun part. I knew from the beginning that I wanted some of it to be beads that hung down to drape around the stem, since the whole point of the story is that the handsome prince climbs up to her window using her hair as a rope (I remember reading that story as a young girl and having the mixed feelings of "That can't be true!" and "I wish my hair could grow that long!") I just used whatever beads I had, and mixed in a few small strings of pearls. The two plaits wind around the stem of the table and are loosely held in place with a couple of orange thumb tacks.